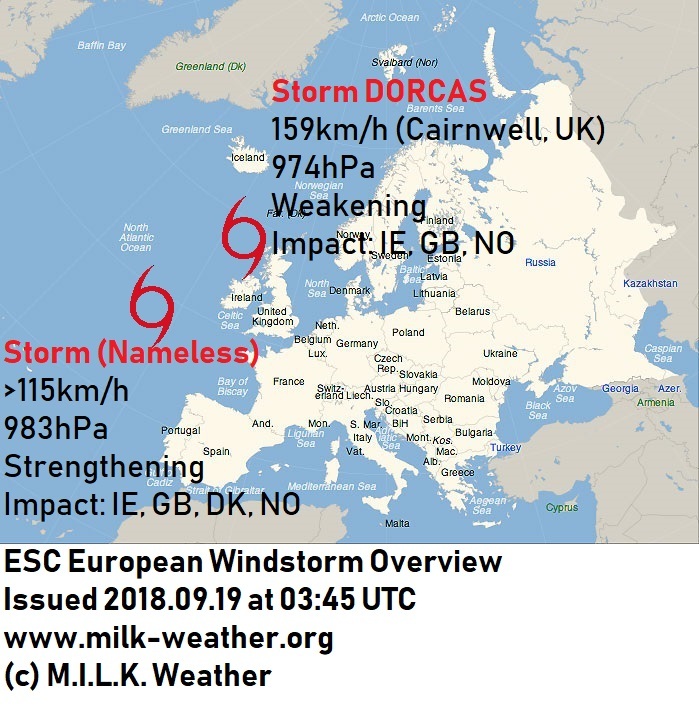 Storm DORCAS is currently impacting especially the northern parts of the UK, bringing storm gusts with peaks of up to 159km/h (registered at Cairnwell, UK). However, this storm is expected to weaken as it moves away from the British Isles today, only bringing storm gusts to Iceland later on. A new storm is on the way though; the currently still unnamed storm with a central pressure of 983 hPa is currently located to the southwest of the British Isles, already packing wind speeds over 115km/h and expected to further increase. Wind speeds in Ireland are expected to soon pick up, and hurricane-forced gusts are to be expected even far inland and in non-exposed locations. However, the coasts will by far experience the worst conditions, with seriously impressive wind speeds possibly exceeding 180km/h being predicted. By the afternoon, the storm will have moved on to the UK, where especially Scotland will receive widespread hurricane-forced winds; gusts are expected to reach up to and maybe even exceed 170km/h here as well. The remaining, more southern parts of the UK will also experience stormy conditions, however to a lesser extent than in Scotland. Through the night, the storm will move on, battering the coast of Norway. A storm watch has been issued as well for the coasts of northwestern Europe due to a potential storm on Friday. 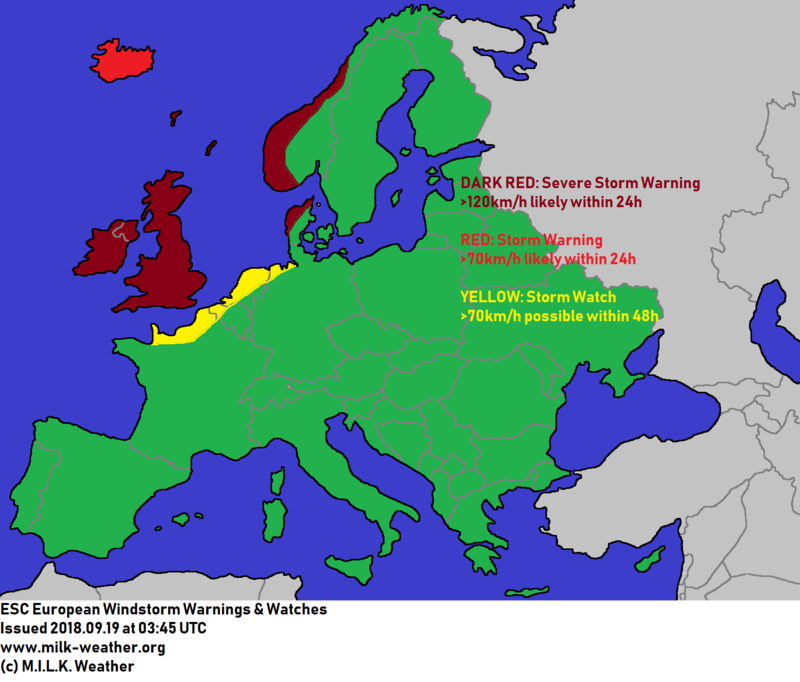 Below are the ESC European Windstorm Overview, Warnings and Watches. This forecast is solely for informative purposes and though is done to the best of the forecaster’s ability, no warranty is given for the accuracy of the information. This entry was posted in Uncategorized on September 19, 2018 by Linus Höller.